I finished another embroidery hoop! I have only one more to do before I think I will have a complete set to hang up. 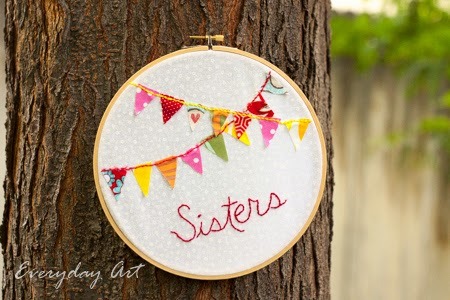 I think this embroidery hoop project turned out particularly cheerful--perfect for my three girls' play room. I cut out a lot of little triangular pennants one night while watching a show with my husband. Then the next night I arranged them how I wanted them and put a little spot of glue on each to hold them in place. Unfortunately, sometimes that little spot of glue was too close to the top of the triangle flag and it was very difficult to push my needle through, so be careful of that. 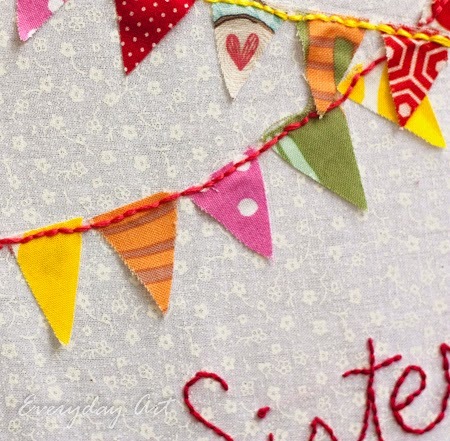 After I had them all glued in place, I did just a simple back stitch along the tops to make it look like a little bunting banner. 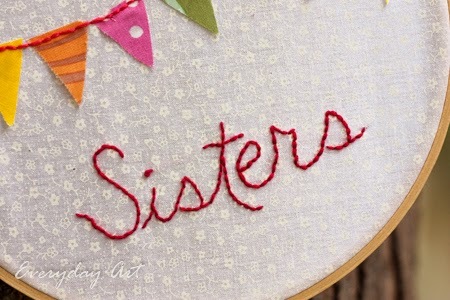 After that was complete, I embroidered on the word "Sisters." I couldn't decide to do a simple block print or cursive, but in the end I thought the cursive would look better, even if they have a more difficult time reading it; they'll learn soon enough. I've been using the same floss and fabric throughout so that each embroidery hoop project will coordinate with the others. I like how they are turning out--cheerful and fun. 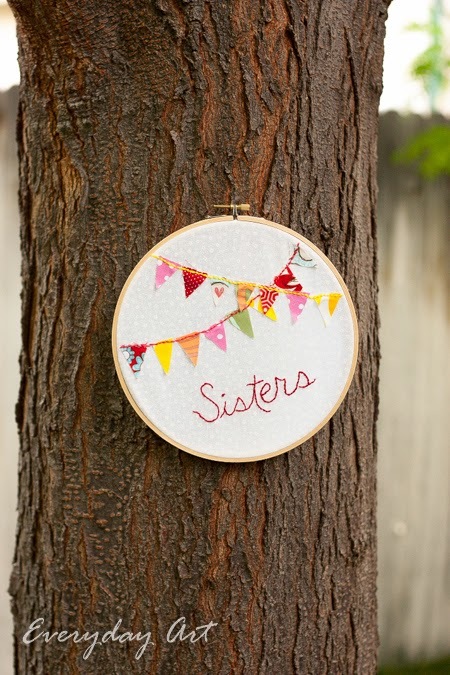 Plus, I love that my girls love playing with each other, so I thought having just the simple word, "sisters" implied more than the word itself. It's a good thing to be hanging on a toy room wall.